Last year, when the school in Marialapa first opened, it was given a single dairy goat as a gift. Goats are amazing animals; they can survive in difficult conditions, aren’t picky eaters, and can produce 16 cups of milk a day, which can supplement student meals or be sold to help pay for school improvements. With enough time, they can also breed and grow into a herd–which is exactly what this goat did. Now the school has more than 10 goats, and this flock is at the heart of a new Opportunity project. 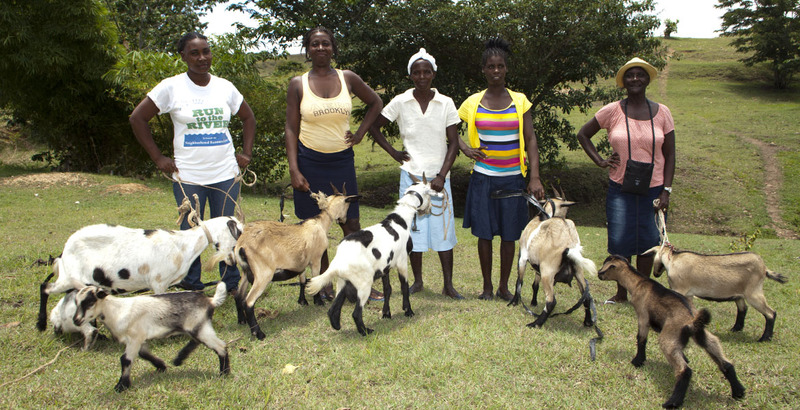 Community members are loaned one goat from the herd to help start their own flock. When the first litter of kids (baby goats) has grown up, one of these new goats is given back to the school in repayment. Then another family is loaned another goat, and the whole cycle keeps going! Along with a goat, families will be given lessons on animal husbandry and business skills. By learning things like strategic budgeting and financial literacy, they’ll be able to use these goats to build a thriving business that will help pay for meals or school supplies for their children. The school’s flock is currently being cared for by a local volunteer, who makes sure these goats are healthy and fed. He also keeps track of which families are looking after which goat. He has never asked for anything in return for tending the goats, other than that his one baby daughter will be guaranteed a place at Marialapa School, and that his wife might have the chance to participate in livelihood training when we begin. We, of course, agreed! Five years after a devastating earthquake struck Haiti, WE Charity is shining the light on our continuing work in this island nation. Join us as we celebrate what we’ve been able to accomplish so far, and reaffirm our commitment to the sustainability and success of this country. ← The 2016 Prince’s Youth Service Awards: Meet the Winners!